"The genius of the modern Arabic novel". 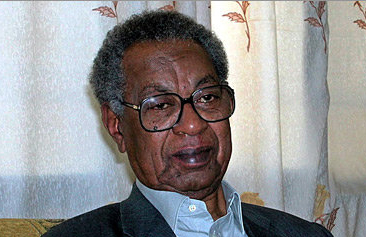 A literary icon in his native Sudan and throughout the Arab-speaking world, Tayeb Salih is the author of the world famous "Season of Migration to the North". The Sudanese writer Tayeb Salih was considered a genius of the modern Arabic novel, despite the fact that he wrote very little. His unassailable reputation rests on the international success of one book: Season of Migration to the North which was first published in Arabic in 1967 by a Lebanese publisher. This book was eventually translated into over 20 languages. Season of Migration to the North received phenomenal critical acclaim and Tayeb Salih was hailed as something of a prophet for Arab and Muslim expatriates living in the western world. His wrote just a handful of other novels and a series of short stories, the most famous of which was his story, The Wedding of Zein later adapted into a play in Libya and a film shot by a Kuwaiti filmmaker Khalid Al-Siddiq which won an award at the 1976 Cannes Film Festival. The story is about Zein, a simpleton who both terrifies and engenders tenderness and mirth amongst his fellow villagers. However events take an unexpected turn when he falls in love with Ni’ma. Tayeb Salih was born in a village in Northern Sudan in 1928 but eventually moved to Khartoum to study at University (Gordon Memorial College). He then travelled to the UK to study for a degree in international affairs. He lived away from his native Sudan for much of his life. He wrote a column for the London-based Arabic language newspaper, “Al Majalla,” mostly on literary issues. He also worked for the BBC at the Arabic Service. Later in his life he was Director General of the Ministry of Information in Qatar. He also worked with UNESCO in Paris, and eventually became the UNESCO representative in the Gulf States. Season of Migration to the North is the tale of a young man who returns to his village in Sudan and meets a newcomer to the village, Mustafa Sa’eed, who eventually recounts the story of a period of his life in London just after the First World War. Sa’eed became a novelty in London and women were attracted to him as to an exotic animal. Mustafa Sa’eed takes his revenge on this society that he rejects and which eventfully rejects him. This is a story of a clash of civilizations and the brutal effects of a superficial “Orientalism” made famous by Edward Said. Mustafa Sa’eed initially angers and then intrigues the young man (the nameless hero of the book) especially when he hears him reciting poetry in English. It turns out the two men have a similar past, bridging both Sudan and the western world. Mustafa Sa’eed eventually tells his story and the young man, the hero of the novel, realises that Mustafa Sa’eed is his doppelganger. “I have redefined the so-called east-west relationship as essentially one of conflict, while it had previously been treated in romantic terms,” Salih once explained in an interview. There is nothing simplistic about the colonial tale of Season of Migration to the North – it is not a one dimensional denunciation of the evils of colonisation but a more subtle tale of the slow corruption of the human soul. Season of Migration to the North ran into trouble with the Sudanese authorities due to some of the sexually explicit episodes in the book, but attempts to censor the book came too late; it was already a runaway success. There are excellent translations of Salih’s books by Denys Johnson-Davies, who also translated his novel Bandarshah, however the complete works, which include a variety of writing, from travel writing, to politics and literary criticism are only available in Arabic. In 2001 the novel was voted the most important Arabic novel of the 20th century by the Arab Literary Academy in Damascus. Salih died in February 2009 at the age of 80.